Jesse Zubot – multi-instrumentalist, producer, record company owner and sideman-in-demand. He produced Tanya Tagaq’s Polaris Prize-winning album, Animism, and has collaborated with a variety of artists, including Steve Reich, Peggy Lee, Hawksley Workman, and Mother Mother. Before any of that, Zubot honed his musician skills in rural Saskatchewan, with a violin found by his instructor. Many years and tours later, he still performs with that instrument. Read on and discover what took Zubot’s violin from “instrument” to necessity. It’s about 200 years old…but that’s almost all he knows about it. It’s become a part of him. It’s also literally a part of him. The violin has an equally mysterious engraving on it’s back, Zubot has had that same pattern tattooed on his shoulder. The instrument has been though a lot. 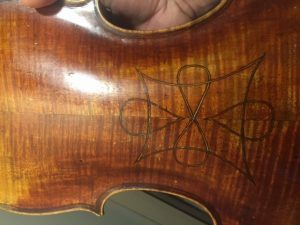 “I am trying my best to keep good care of it, but after twenty years of constant touring, doing every kind of gig imaginable, it has paid its dues.” The violin has many small cracks and repairs, and its neck has even been broken a few times. It’s deep, and that makes it great for improvising. 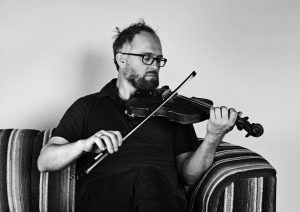 Jesse Zubot is performing with Andréa Tyniec in Almost Unplugged, part of Soundstreams’ Ear Candy series, February 1 at Buddies in Bad Times Theatre. Tickets $20 in advance. Buy your ticket here.